When you hear the name “Pippi Longstocking,” you likely immediately picture a vivacious, free-spirited Scandinavian scamp with red braids and a talent for mischief. But what about her creator, celebrated Swedish author Astrid Lindgren? In Becoming Astrid, director/co-writer Pernille Fischer Christensen reminds us that the authors behind some of the world’s most beloved children’s book characters were living, breathing people with complicated lives and all-too-human struggles. The movie introduces us to Astrid (Alba August) as a smart, curious teen who often chafes at the restrictions of her quiet life as the daughter of devout Swedish farmers. But when she starts working for unhappily married Axel Blomberg (Henrik Rafaelsen), the editor of the town’s newspaper, her world opens — in many ways. She realizes she has a talent for writing, and she eventually becomes Blomberg’s lover. An unplanned pregnancy follows, and Astrid quickly finds herself whisked out of town, living in the big city and learning secretarial skills, enduring a painful separation from her baby son in hopes of helping Blomberg dodge adultery charges. As her difficult situation open her eyes to the realities of adulthood, Astrid finds herself far from the simple life she led in the country. But her imagination and zest for experience never leave her, and she grows as a person while figuring out the best path for her and her son. August portrays all of this sympathetically and believably, her insecurity and hesitation eventually morphing into confidence and resolve. Christensen directs her with confidence, and the script supports her journey. MaryAnn Johanson What a lovely film, and such a rare and welcome one about a female misfit. I especially love how motherhood here isn’t treated as a distraction from or a hinderance to a creative life but as a source of inspiration for Astrid’s fiction… one that resulted in work that resonated with children. If a movie like this one is rare, it’s an even rarer one that manages to suggest that women can be mothers and still have an intellectual life: too often in our culture these are treated as if they are mutually exclusive, even though women have always known they are quite compatible. Loren King Whether you are a fan of the beloved Pippi Longstocking tales, or know nothing about them or their author, Astrid Lindgren, Becoming Astrid is a welcome introduction. Danish director Pernille Fischer Christensen crafts an incisive, engaging portrait of the artist as a young woman, focusing on her formative years before she became an acclaimed children’s author. Read full review. Kristen Page Kirby It’s always a risk to put an entire movie on one actor’s shoulders, but when those shoulders are as strong as Alba August’s that risk pays off. August takes Astrid Lindgren-to-be on the journey from youth to adulthood and achieves the delicate balance of showing how the years change her while keeping the sprightly, imaginative and sharp girl we saw at the beginning present even in the dark times. Often, movies about women writers are about the business of writing — struggles to get published, overt sexism, lack of equitable pay and the like. But no author, male or female, leaps onto the page fully formed, but is shaped by the sum of past experiences. 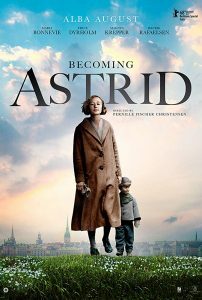 Beautifully written and shot, as well as profoundly moving at times, Becoming Astrid shows how Lindgren’s development as a writer started long before she became an author. Esther Iverem: Becoming Astrid keeps you glued to screen, watching the slowly developing portrait of the artist as a young woman. What shines most is the impact of the rural, Christian fundamentalist home and community in Sweden where writer Astrid Lindgren was raised. Less represented is Lindgren’s own inner voice and mind, which is what ultimately created her best-selling children’s books. Actress Alba August also shines! Sandie Angulo Chen: Becoming Astrid is a fascinating biopic about the world’s most translated children’s author, Swedish writer Astrid Lindgren, best known for her Pippi Longstocking books. Starring a fabulous Alba August as a teen to young-adult Astrid, the movie concentrates solely on life-changing events in Astrid’s adolescence – when she had an affair with her married editor at a local newspaper, became pregnant at 18, and had to flee her small Swedish hometown to avoid the shame of having a child out of wedlock. It’s amazing to think that in an era when single motherhood was taboo, Lindgren – then Astrid Ericsson – was able to persevere. Several times throughout the film, a well-meaning adult (her father, mother, her baby’s Danish foster mother) tells her: “You can do this.” That spirit of endurance and overcoming circustances is prevalent in Lindgren’s stories. The movie is framed by a shot of an older Astrid opening and reading children’s letters to her. They’re narrated throughout the story as reminders of everything she overcame as a young woman. 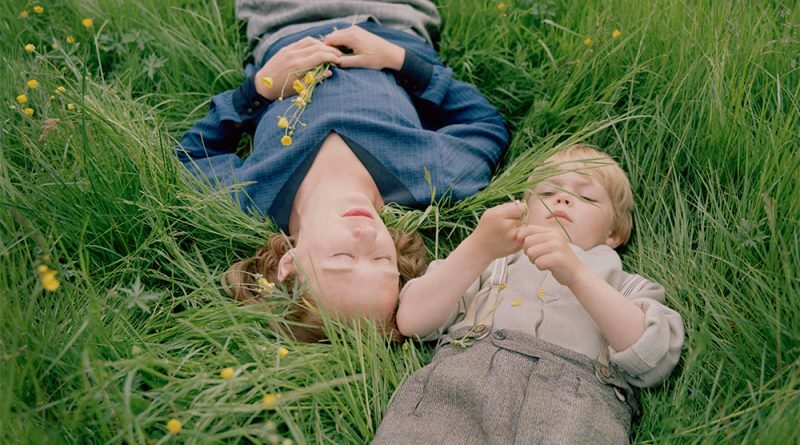 Writer-director Pernille Fischer Christensen focuses on these formative years in Astrid’s life, and the movie ends before Lindgren even becomes a Lindgren or writes her first Pippi tale. It’s all the better because of that narrow scope, allowing Astrid to develop into the imaginative single mother it’s clear has plenty of stories to share. Nell Minow: Who would imagine a red-headed girl with pigtails who is as strong as a superhero, has a pet monkey and a horse she can lift and carry, and lives happily alone? Only Astrid Lindgren, whose own story from childhood through her 20’s is told in Becoming Astrid, directed by Pernille Fischer Christensen. Warmly sympathetic to the bright, determined, and courageous young girl, played with sensitivity and spirit by Alba August, with gorgeous cinematography and meticulous period detail, the film gives us an absorbing look at Lindgren’s early life and a glimpse of her influence on generations of children. Jennifer Merin Danish filmmaker Pernille Fischer Christensen’s Becoming Astrid is a compelling truth-based biopic about Swedish novelist and screenwriter Astrid Lindgren, creator of Pippi Longstocking and other beloved children’s books. The narrative takes place in rural Sweden, where an unwed Astrid becomes pregnant, then follows the writer to Denmark and through her efforts to keep her baby while keeping the baby’s father from imprisonment for adultery. Alba August is absolutely superb as Astrid, showing her character to be a remarkably spirited and independent woman whose personal struggles against the repressive conventions of her day are truly affecting and inspiring. Cate Marquis Becoming Astrid tells the surprising, moving tale of the young life of Astrid Lindgren, the author of the beloved children’s tale Pippi Longstocking and other stories. Danish director Pernille Fischer Christensen depicts the struggles of young Astrid, who gave birth out-of-wedlock yet persevered in going her own way and build her own life. With a remarkable performance by Alba August as Astrid, who portrays Astrid from a high-spirited playful teen in pigtails to a confident young woman, Becoming Astrid is a gorgeous, polished, warm film that tells a bittersweet yet inspiring untold story of an author whose name we know well, as a young woman finding her own power and her way freedom. Marilyn Ferdinand: Women writers seem to be in vogue on the silver screen lately, and the latest biopic, from Danish director Pernille Fischer Christensen, deals with the coming of age of Swedish writer Astrid Lindgren (1907-2002). Lindgren, known throughout the world for her various children’s book series, especially the Pippi Longstocking books, based many of her stories on her life growing up near Vimmerby, in the northwestern part of Sweden. Becoming Astrid faithfully reproduces her experiences from around the age of 16 until about the age of 27. The film details her affair with her boss, a newspaper editor, her move to Stockholm upon discovering herself pregnant, and the nearly three years she left her son in foster care while her lover tried to secure a divorce. The film is beautifully shot, and Alba August is beyond good in her portrayal of Astrid, managing to find a great many moods in what was a fraught period in Lindgren’s life. Yet, this film doesn’t really shed light on Lindgren as a writer, perhaps because it gives us so little of her girlhood and nothing of her writing. The periodic voiceovers by young readers of her work as an elderly Lindgren, introduced to us at the beginning of the film (Alicia Vikander’s mother Maria Fahl-Vikander), reads her fan mail don’t really connect to the incidents Christensen shows. Nonetheless, BECOMING ASTRID is a skillfully crafted film with great emotional resonance due to its uniformly fine cast.